Sectional couches are versatile because they allow you to arrange your furniture in a number of different ways. Building a conversation area becomes easier when you have a sectional couch. All you have to do is imagine a person sitting in each seat. This includes any recliners, love seats or chairs you may have in your living room arrangement. Position the furniture so that everyone can easily see each other and carry on a conversation while making eye contact. Remember to utilize the mobility of a sectional sofa. Depending on the number of pieces included in your couch, most are designed to include up to ten different configurations. You can refer to a catalog or owner's manual that may show each configuration or you can use your own imagination to come up with a seating arrangement that makes you happy. Also remember that you don't have to have every piece touching each other. Don't be afraid to add some space in between the pieces if needed. There really is no wrong way to arrange a sectional couch. It's all a matter of personal taste. If you don't know where to start when trying to decide on a seating arrangement, it might help to create a focal point. The focal point will depend on the room and the other objects in the room. For instance, if your sectional sofa is in a formal living room, the focal point may be a fireplace or a large window with a scenic view. In this case, you would want to build a comfortable conversation area around the focal point. This means that everyone would be able to comfortably talk while having the focal point easily in view. If your sectional couch is in a family room or game room, you would want to arrange the pieces so that everyone could easily be in view of the television or table where games are being played. Perhaps the sectional sofa is in a music room. In this case, you would want to arrange the pieces so that everyone can comfortably watch the artist or band who is performing. In an open floor plan, you can arrange a sectional couch to be a room divider. The L-shaped design of a sectional sofa creates a pseudo wall that acts as a kind of hallway when arranged in the appropriate distance from an existing wall. The sectional couch itself can act as a dividing element in a large room. 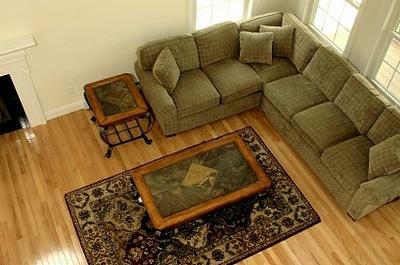 Sectional couches are available in a variety of different styles. When choosing the style of couch you want, color will be a major factor. If you are buying a new couch, pay careful attention to the room and the dominant colors. What color are the walls? Are they traditional drywall or do you live in a log home? Obviously, if the walls in the room are white, almost any color of sectional sofa will work. The next choice will be texture. Do you want a sectional made out of leather or would you prefer something softer and considerably less expensive? Another important consideration will be size. You may find a style of sectional couch you love, but will it fit in the space you have? You should take measurements of the area where you plan to put your sectional sofa to make sure you have the room for it. Style, like the arrangement you will ultimately decide on for your sectional couch, is a matter of personal taste. However, you will want the style you choose to make sense with the overall style of the room. It might look funny to put a southwestern style sectional couch in a room with an Asian theme. Sectional couches allow you to change the look of a room simply by arranging them in different configurations. Challenge yourself to see how many you can come up with.